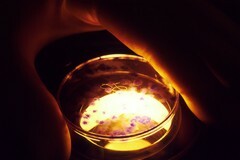 A tissue culture dish mounted under a microscope for viewing by a technician. A rubber gloved technician's hands are visible, adjusting the dish. This test measures the effects of chemicals on cultured hamster embryo cells.